This page about the redwoods and Big Basin Redwoods Park is for the guests of the Inn of the Beachcomber and those of you that found it in cyber space. The Beachcomber is a 47 unit inn located on the beach in Gold Beach Oregon. We are 53 miles from the Redwood National Park Headquarters in Crescent City, California and all that the coastal redwoods have to offer. I have added some useful links at the bottom of the page for some of the Redwood State Park sights, including a link to Big Basin Redwoods Park south of San Francisco. If you want to check out our cool beach click here to see our live HD web cam. The Redwoods are an eco system that spans from southern Oregon deep into California. It is state land, federal land and private lands all in the same eco system. Redwood National Park Headquarters is in Crescent City, California which in about 52 miles from here, The Inn of the Beachcomber in Gold Beach Oregon. Big Basin State Park, & the Santa Cruz Mountains, is 470 miles from the Beachcomber. I thought I would include Big Basin State Park in our Redwood Park section for those of you that are heading down that way to Santa Cruz, Carmel or Big Sur. Big Basin is basically down Hwy 101 then Interstate 280 to State Hwy 35 and then to Big Basin Hwy. It’s pretty cool that you can find such awesome trees so close to the heart of California. I mean it makes sense with all the fog in the bay area and how the redwood trees have such a unique relationship with the fog in their ecosystem. In 1769 King Charles III of Spain sent the expedition of father Junípero Serra and Gaspar de Portola to California of New Spain. He wanted to establish a strong Spanish presence in Las Californias to prevent Russian expansion from Alaska. 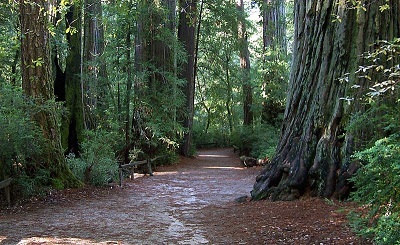 Portola discovered Big Basin and became the first foreign group to see the Coast Redwoods in October 1769. The expedition camped at the mouth of Waddell Creek, in present-day Big Basin. Big Basin State Park is the oldest of the Redwood Parks dating back to 1902 with 18,000 acres of ancient redwoods and probably the oldest stands of second growth redwoods. You’ll find over 80 miles of trails in the park and camping. The park is open year around but reservations are needed in the summer. Not a big surprise with how close it is to Silicon Valley and the rest of the bay area. Big Basin Redwoods Park is the oldest state park in California and the redwoods complex. Big Basin is located south of San Francisco, not too far from US 1. Big Basin State Park can be approached from the east, through redwood forest and coastal mountains, or from the coast, along State Route 1. The eastern route, over State Route 9 through Saratoga and smaller towns like Boulder Creek is more popular. 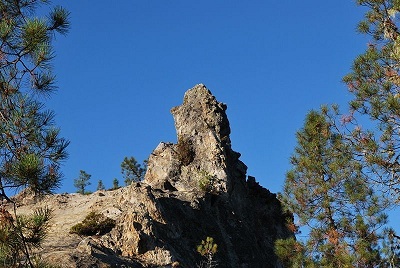 This route passes Castle Rock State Park (California) on the eastern side of the Santa Cruz range. Big Basin Redwoods Park has a variety of micro climates, due to its proximity to the Pacific Ocean and to the Santa Cruz Mountains. Elevations in the park begin at sea level to over 2,000 feet. The climate ranges from foggy and damp near the ocean to sunny, warm ridge tops. Bird watching, hiking, waterfalls, and of course, some really old redwood trees are the main attractions at Big Basin. From Hwy 1, Gazos Creek road is a good fire-road route for mountain bikes, which can then descend into the headquarters area if you are looking for a good ride.